Anla records was the soul subsidiary of cult Louisiana record label Goldband. 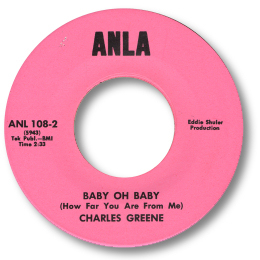 Owner Eddie Shuler wanted a different logo to separate the more modern sounds from his original label’s traditional fare and set up Anla (a contraction of Goldband and Louisiana) in 1968. A lot of the output was funk orientated but there were quite a few strong deep tracks as well from artists like Big , Soul Shouting Tommy, Dynamic Adam and Ike Porter. But Baby Oh Baby is one of the best tracks on the label. Charles Greene had a really big powerful voice – reminds me of Jimmy Robins or Little Joe Hinton with its gruff, almost untutored authority. He sings clearly and compellingly over the dead slow backing. No danger of a vocalist this commanding being upstaged no matter how big the fine horn section is. The final little rap works very well too. A fine deep soul piece worthy of greater recognition.